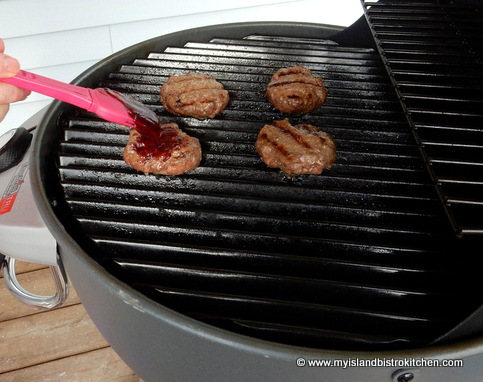 With the abundance of local blueberries in season and available locally, I try to maximize my use of them. 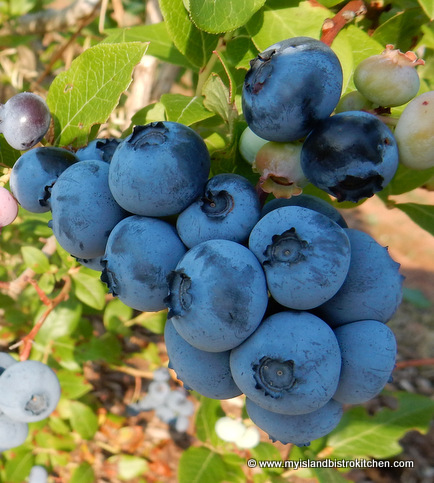 So, today, I am introducing my recipe for blueberry barbeque sauce made with high bush blueberries picked at Tryon U-Pick Blueberries in North Tryon, PEI. 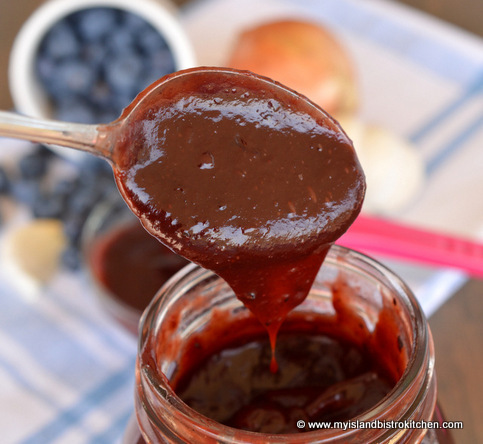 As well as being tasty, this sauce is a lovely deep rich color. This sauce is very versatile and can be used in the same recipes and on the same foods as any barbeque sauce. 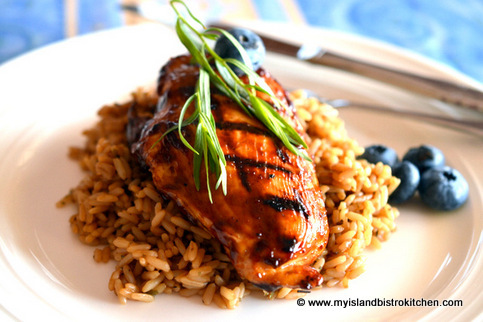 It is particularly good brushed on grilled chicken, pork chops, ribs, and burgers. 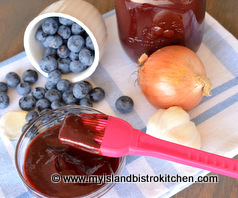 Adding some blueberry balsamic vinegar to the sauce deepens the blueberry flavour. I used a chipotle and lemongrass infused maple syrup to add flavour complexity but plain maple syrup also works well. Heat oil in saucepan. Add onion and sauté for 2-3 minutes then add garlic. Sauté, stirring constantly to prevent burning, for a further 1-2 minutes. 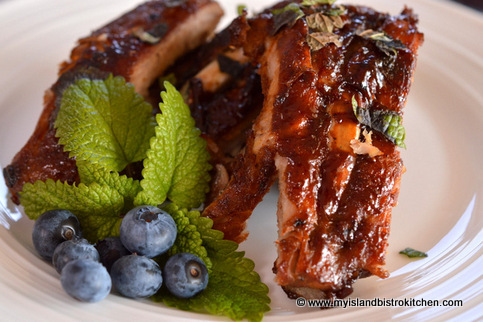 Add the blueberries, ketchup, balsamic vinegar, pineapple juice, brown sugar, maple syrup, chicken bouillon, mustard, lemon juice, and spices. Bring mixture to the boiling point then reduce heat to medium-low. Cook, stirring occasionally, for about 20 minutes. In small bowl, mix 1 tsp cornstarch with 1 tbsp pineapple juice until smooth. Add 1-2 tsp of the hot mixture. Stir and add to the hot mixture in the saucepan. Cook, stirring regularly, until mixture is thickened to desired consistency. 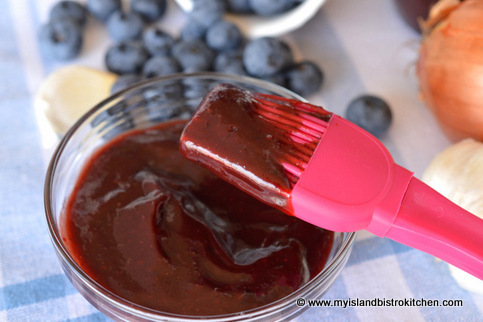 Purée sauce till smooth in blender, food processor, or with an immersion blender.